Russia may create private military companies and possibly use them for missions abroad. Prime Minister and President-elect Vladimir Putin mentioned this possibility after he delivered his report on the government’s performance in 2012 to the State Duma. Many countries have such companies, but the issue needs to be carefully considered given the specific circumstances of Russia. The possibility of using private military companies (PMCs) as a tool of Russian influence abroad was raised by A Just Russia deputy Alexei Mitrofanov. What exactly is meant by this, given the wealth of international experience in this area and how could it be implemented in the reality of today’s Russia? One of the previous attempts to use such “indirect tools of influence” nearly led to the appearance of two semi-piratic states in Africa in the 1960s: copper-rich Katanga, which declared independence from Congo in 1960 and rejoined it only after UN intervention in 1963, and Biafra, which seceded from Nigeria in 1967 and was reincorporated into it in 1970. The colonial powers, which were leaving Africa at the time, needed an additional instrument for stabilizing the continent. Initially European mercenaries, hired by local governments, were used to fight the guerrillas. However, they were also hired to overthrow the “wrong” governments, which they did quickly and usually at night, so that the TV crews which arrived at the site in the morning saw only beaming locals armed with heavy weaponry. Some of these stories ended in embarrassment. Colonel Bob Denard, a French soldier and mercenary who had fought in Katanga, and his group of mercenaries escaped by the skin of their teeth when they tried to overthrow the leftist president of Benin in 1977. But Denard’s other missions, for example in the Comoros, were completed quite successfully. Mercenaries were based in white-dominated southern Africa, including Rhodesia during Ian Smith’s term as prime minister and South Africa when it was ruled by the Boers. When the international community took harsh measures against the mercenaries, including by adopting the UN Mercenary Convention, the vacuum was filled by private military companies, hired by African governments to ensure “systemic security under difficult conditions.” The best known of these was Executive Outcomes, which operated in South Africa and was dissolved in late 1998 as a legal entity, but not as a community of mercenaries. By the mid-1990s, PMCs could choose from a vast number of retired military professionals in NATO countries after the end of the Cold War. The number of Soviet servicemen, in particular pilots and engineers, on hire in the air forces of African countries went up sharply, too. The demand for the services of PMCs increased as conflicts and even local wars flared up on the periphery of the former Soviet zone of influence, and African regimes started fighting over their countries’ meager resources. Western governments readily used PMCs to resolve a growing number of such problems. The market was dominated by retired U.S. and British colonels, who discreetly worked hand in glove with their governments and security services. Private military companies mushroomed and soon became the key element of the presence of the wealthiest countries in the hot spots around the world. If the golden age of mercenaries was in the 1960s in Congo, then Iraq and Afghanistan in the 2000s can be considered the platinum age. Mercenaries were paid mind-boggling daily rates of $1,000, $1,500 and more for operations in the conflict zones, approximately seven times more than U.S. military forces with comparable qualifications. Private military companies resurfaced in Libya in 2011 in their traditional form – as trained fighters and instructors of the rebels, who still only managed to break the resistance of the pro-Gaddafi forces after six months of NATO air raids and a ground operation led by troops from Britain, Qatar, the UAE and possibly France. The establishment of private military companies in Russia is a possibility, according to what Putin has said. But there are many nuances bound up in its implementation. The point at issue is not how to control the “contract workforce,” which will not be officially employed by the state. Control magically becomes possible when the government needs the contract workforce to exert indirect influence on its behalf. After all, PMCs are not private street kiosks or garages. Much more interesting is the question of what form the PMCs will take in the specific conditions pertaining to Russia. There is a limited market for their services after all and so they will have to rely heavily on major Russian corporations – in other words state energy concerns. They will be hired above all to protect the infrastructure and production areas of these corporations in Russia and abroad. 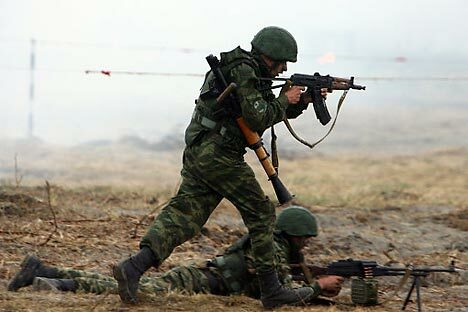 Another possible area for their deployment could be to help implement Eurasian integration, which is changing the CIS space and increasing Russia’s presence in some unstable post-Soviet republics, primarily in Central Asia but also possibly in the self-proclaimed Caucasus republics of Abkhazia and South Ossetia. Russian PMCs could be also used in Afghanistan, whose pseudo-stability has closely tied the interests of NATO with those of Moscow. The deployment of additional troops there may be difficult due to local problems and political losses, but the use of the contract workforce could smooth off some rough edges. At the same time, PMCs could be a good way to offer retired servicemen new employment opportunities at a time when Russia’s Defense and Interior Ministries are planning to reduce their workforces.